Unbounded is an installation and performance project in collaboration with artrock band Sbudellatron for This is a magazine. Episode 25, an exhibition curated by Donnachie-Simionato (This is a magazine) and Chiara Agnello at Care Of/DOCVA in Milano. 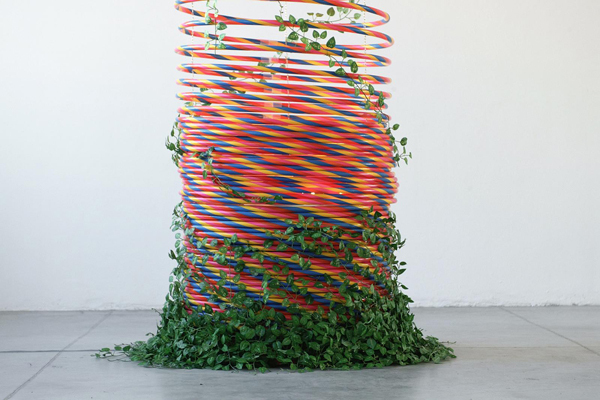 The project consists in a single-person stage based on a tubular structure realized arranging dozens of hula-hoops in decreasing order starting from the floor. On the stage, in Milan, one of the two members of the band plays electronic instruments while the other one plays the guitar and sings in London, materializing in Milano through a video projected on the wall behind the installation. Unbounded aims to be a research on the meaning of remoteness and separation staging, inside a cage-like structure, a music performance at a distance. Unbounded works as a cerebral superstructure, a sort of anti-stage for a hallucinogen synaesthetic experience strengthened by Sbudellatron’s post-nuclear sound. 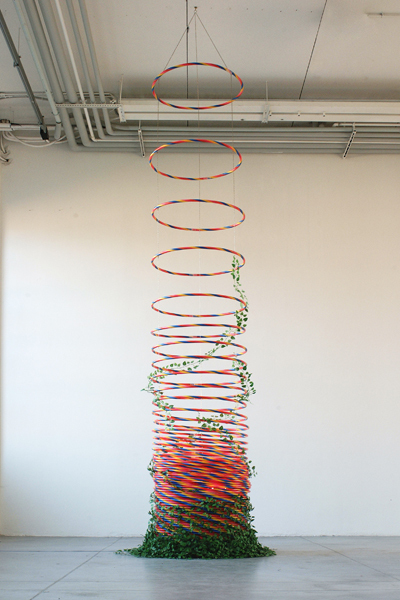 Hula-hoops represent the entrance in a world other than that where the event takes place, materializing in front of the public a transportation channel towards a new space-temporal condition where the coordinate system we know collapses.